Ah, my first Comic-Con! Before I grew bitter and jaded and started casting around excuses to skip it and go to Hawaii instead! I drew this strip at the Eisner Awards. I think this was the year Rory Root, owner of Comic Relief, let Andrew and me sit with his staff at one of the tables up front. It was dark, I was drawing on a tablecloth, and I didn’t pencil anything beforehand, so try to look kindly upon this shaky effort. As you can probably gather from the strip, I didn’t have a table of my own at Comic-Con that year, and just hung out at the Cartoon Art Museum and Friends of Lulu tables, doodling. The guy in the second panel later wrote to me to point out that I didn’t draw in his ponytail, since I hadn’t seen the back of his head. I’m pretty impressed that he recognized himself. The Farago Mell shirt…for a while, Andrew and I made a T-shirt for ourselves every year to commemorate our stint at the Alternative Press Expo. The first of these shirts sported the image of Andrew’s badass gun-toting Mell. I’ve still got it, of course. It’s not nice to harass booth babes. They’ve got a rough job. Comic-book conventions do tend to have an amazing ability to put the T&A booths immediately next to or opposite the people who would least like to look at a T&A booth all day. 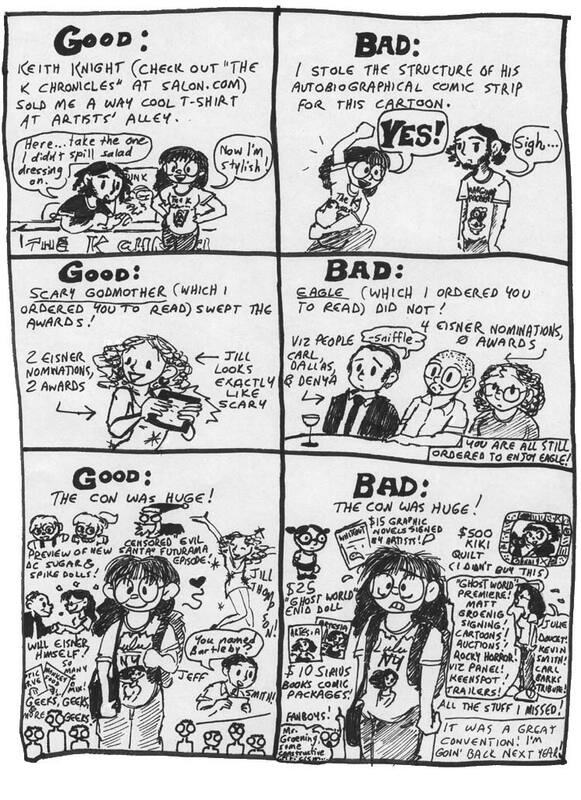 Trina Robbins (whom I knew pretty well at this point; she lives in my neighborhood here in SF and comes to Cartoon Art Museum events) totally swept the Lulus that year. I was nominated in the New Talent category, which went to Anne Timmons, Trina’s artist on Go Girl. I did win Lulu of the Year in 2005. That’s basically the worst drawing of Keith Knight anyone has ever done in history. His expression in the second panel is actually pretty accurate, though. Omigosh, is there anything sadder than a sad Carl Horn with a single tear running down his cheek? There is not. That is the saddest thing ever. Will Eisner died in 2005. I’m really glad I got the chance, however brief, to shake his hand. Man, you mean there was a second page of Shaenon’s Comic-Con 2001 Report, all this time? Aaah. Now I have no choice but to doubt everything I know. Did I ever mention that I find the Shaenon character in the Sunday strips to be very cute? So you google for 2001 eisner award nominees instead. Follow the top result. 2001 Will Eisner Comic Industry Award Nominees and Winners http://www.hahnlibrary.net/comics/awards/eisner01.php and use the browser’s find command to search that list for eagle. Those 5 matches will give you “Eagle, by Kaiji Kawaguchi”. Now google for Eagle, by Kaiji Kawaguchi and you will find his page from Wikipedia, the free encyclopedia. Click on Eagle in the first paragraph of that page and you get redirected to “Eagle: The Making of an Asian-American President”. Scroll down to the Manga section and you see the ISBN Numbers for the five long tankōbon volumes. The series spans over 2000 pages in all. You have to be smarter than the machiene.